Greek Prime Minister GeorgePapandreou speaks during a parliament session in Athens on Thursday, AP. Athens: Greek prime minister George Papandreou faces a knife-edge confidence vote on Friday after his plan for a referendum on a bailout -- supposed to save both Greece and the euro zone from disaster -- backfired spectacularly. But even if his socialist government survives the parliamentary vote, Papandreou’s days as Greek leader looked numbered after a deal with his cabinet under which, government sources said, he agreed to stand down after negotiating a coalition with the conservative opposition. Papandreou came out fighting, rejecting opposition demands, in public at least, that he make way for a caretaker administration with just two tasks: forcing the bailout through parliament without a referendum and calling a snap election. 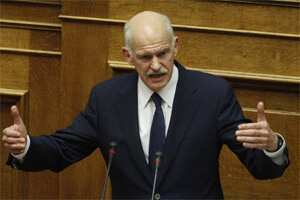 However, analysts said Papandreou may not be around much longer to fight such battles. “The prime minister’s position is very difficult, since he chose not to respond to the opposition’s proposal for a transitional coalition government. Therefore I believe that it is unlikely that he will win the vote," said head of ALCO pollsters, Costas Panagopoulos. Through waves of austerity policies demanded by the nation’s international lenders, Papandreou has carried the parliamentary group of his PASOK party with him, despite much grumbling within the ranks. But a steady trickle of defections has reduced his majority to the point that one or two waverers could inflict a defeat in the confidence vote, expected as late as midnight (2200 GMT). PASOK has 152 deputies in the 300-member parliament. But lawmaker Eva Kaili said that while she would stay in the party, she would refuse to support the government in the confidence vote, meaning Papandreou could count at most on the support of 151 deputies. Only one more defection would strip the government of its majority and probably trigger an early election. Asian shares rose more than 2 percent and the euro steadied on hopes the referendum would be abandoned, but investors remained cautious over the confidence vote and the impact of any election. “If Greece is heading for a general election and no party looks able to win an outright majority, which appears quite likely now, then the crisis will only deepen," said Teppei Ino, currency strategist at the Bank of Tokyo-Mitsubishi UFJ. Greeks have fought tooth and nail against policies which have brought spending cuts, tax rises and job losses, pushing the nation into three years of recession, and they have staged a series of strikes and protests, some of which turned violent. This made a “no" vote in any referendum highly likely, even though this would cut off Greece’s last international financial lifeline and risked spreading its debt crisis to much bigger euro zone economies, such as Italy and Spain. But after a tumultuous day in Greek politics, the chances of the referendum being held dwindled to almost nothing on Thursday. Papandreou offered to drop the idea anyway if the conservative opposition backed the bailout in parliament. Over the day, he talked about negotiating with the conservative New Democracy party, saying the national interest ranked well above his personal ambitions. “I’m not tied to my post. I’m not interested either in being re-elected, I’m only interested in saving the country," he told parliament. Papandreou also called on his PASOK party to rally behind him in the confidence vote. But his public bravado appeared to mask an acceptance that his term may come to an end soon. Government sources said Papandreou had struck a deal at a cabinet meeting on Thursday under which he would stand down after he had negotiated a coalition agreement with the conservative opposition -- provided he survives Friday’s vote. Ministers involved in striking the deal with Papandreou, led by finance minister Evangelos Venizelos, said he should go for the sake of their PASOK party, said the sources, who had knowledge of Thursday’s meeting of the cabinet. “He was told that he must leave calmly in order to save his party," one source told Reuters on condition of anonymity. “He agreed to step down. It was very civilised, with no acrimony." Papandreou admitted he had made a mistake in calling on Monday for the referendum on a bailout, the sources said. German chancellor Angela Merkel and French President Nicolas Sarkozy summoned Papandreou and Venizelos to Cannes on Wednesday where they made clear Greece would receive no EU aid if the nation failed to stick to the deal.